The Drum Legends, at Brighton Dome, next month, will feature the power(houses) behind the throne, these are the men who keep the beat, move the pace, weld together the instruments and provide the musical foundation and the centrifugal force on any stage they grace. There have been various renowned drummers over the years but few more evocative, charismatic and diverse in style than these three icons of the drum stool – Ginger Baker, Pete York and Herman Rarebell. Tub thumpers extraordinaire, each doing different (and seemingly impossible) things with every limb, these are the men who have forged rhythms with the best of them. Together they provide an unsurpassed rock heritage spanning Cream, The Spencer Davis Group and The Scorpions. On April 12th 2019 the three will take centre stage at the Brighton Dome bringing their unique, genre-crossing, playing styles to show just what it takes to be top of the game. They will delve into their back catalogues to showcase their massive hits including White Room, Gimme Some Lovin', Rock You Like A Hurricane, Passion Rules The Game and Sunshine Of Your Love. 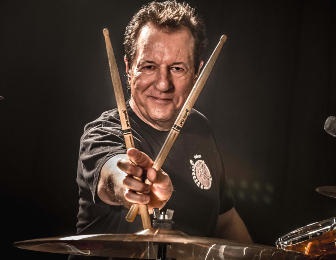 Backed by a coterie of top musicians including the unstoppable Bernie Marsden (Whitesnake etc), Abbas Dodoo and Alec Dankworth, all three main men will play together at the end of the night to demonstrate just how much fun can be had on a drum kit. The gig is a rare opportunity for drum lovers and music fans to watch, listen and learn from their drum heroes. Drum Legends at Brighton Dome Concert Hall on Friday 12th April 2019. To book tickets CLICK HERE.